A 50-foot humpback whale was spotted in Rhode Island's Narragansett Bay on Monday. North Kingstown Harbormaster Ed Hughes says he saw the whale breaching in the water. Hughes was at a marina north of Quonset Point when he spotted what he originally thought was a boat. 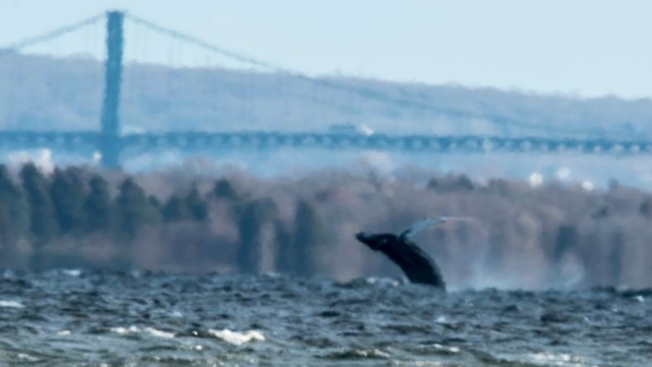 You can see the Mount Hope Bridge behind the humpback whale in the photo. Humpback whales are not common inside the bay. Officers with the Department of Environmental Management checked on the whale and said it was in good condition and last seen headed south.